#5 – Dragon Slayer – What's Eric Playing? July 26, 2015 November 6, 2016 • What's Eric Playing? Play time: 15 minutes per round, maybe. I figured that writing only 2500 words on Anomia was slacking off, since I did 4000 on the Lost Legacy Four-Pack last week. That seems inherently irresponsible, so here we are. This is a microgame, folks, so prep yourselves accordingly. Dragon Slayer is a “Press Your Luck” kind of game (with its own kind of Whammy, to continue the reference) based on being a noble warrior trying to kill dragons for some reason. Maybe you’re hungry. Maybe they killed your father, and they should prepare to die. Maybe you’re just some kind of fanatical dragon hater who made a drunk bet with his friends. Who knows. Let’s talk about Dragon Slayer. These are challenge tokens. Again, I’ll explain them in Gameplay. Set them aside. That’s the entire setup for the base game. Literally, just putting things together. This Battlemat and Score Tracker are super helpful, as they help you keep track of which dragons you’ve slain and how many pieces of the current dragon you’ve collected. More on that later. The Score Tracker tracks scores, shockingly. If you have these, just put them somewhere in the middle. 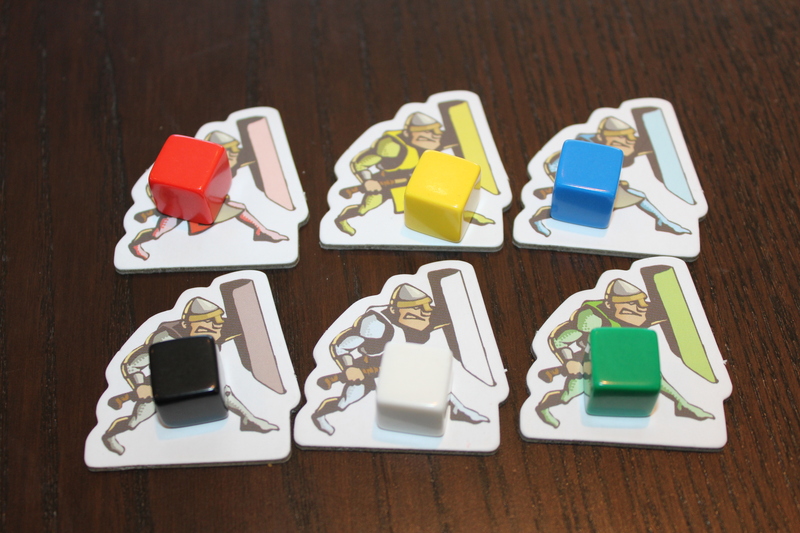 This collection of dudes (no female dragon slayers, apparently) are player tokens. You use the little squares on the Score Tracker and the actual warrior pieces don’t … really … do much. Not 100% sure why they’re there other than aesthetics, which is a perfectly valid reason. Alright, you should be done setting up the game by now. Let’s get started. Dragon Head: Set this aside. It’s a piece of the dragon! Dragon Wing: Set this aside. It’s a piece of the dragon! Dragon Tail: Set this aside. It’s a piece of the dragon! 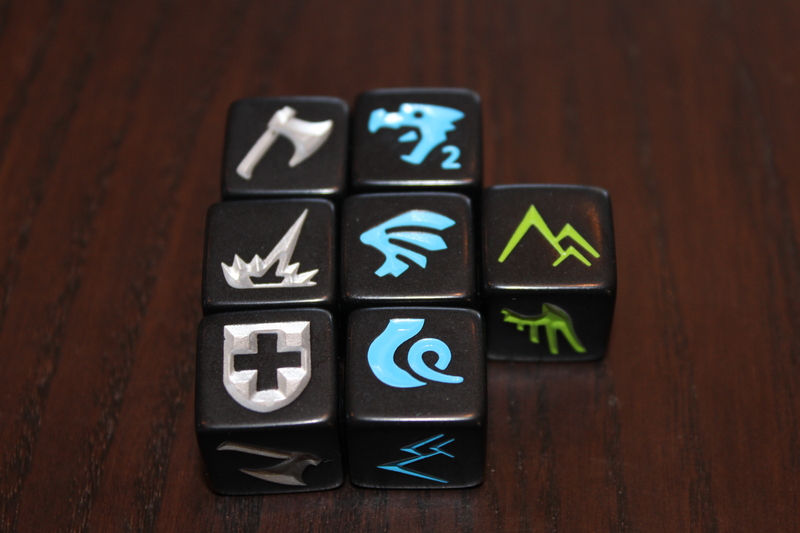 Mountain: Re-roll this die after resolving your roll. Fire Breath: Lose one warrior die for the remainder of your turn, starting with any Axes. Shield: Prevent the effect of one Fire Breath. Axe: If you’ve collected all the dragon pieces, an Axe lets you slay that dragon. Set the dragon aside. Red is the most difficult and worth 6 points for slaying it. Green is the middle ground and worth 4 points. Blue is the easiest and worth 2 points. You play until you’re done, and you can go back and fight the same dragon again as long as you’ve already defeated one Red-Green-Blue set (meaning you’ve already killed all three dragons). Once someone hits 40 points, you play until everyone has had an equal number of turns (meaning that if the last player hits 40 first, the game just ends), and then the highest scoring player wins. Playing aggressively may pay off, but, if you get toasted, you score zero points for your turn. No matter how many dragons you’ve slain before that. Because, well, you retreated. Your friends aren’t gonna let you live that down. Wuss. You’ll live to fight another day, though, so you’ve got that going for you, which is nice. Naturally, this leads to a fairly conservative play style, especially if you’ve only got one Warrior Die remaining. Good thing there’s no way that could be a problem for you. Challenge Tokens: They’re a problem for you. You can decline the challenge. You get half points for your entire turn, and the challenger gets 5 points. This can be rough if you’re on a hot streak. You can accept the challenge and get toasted. You get zero points for your entire turn, and the challenger gets 5 points. This can also be rough. You can accept the challenge and win. You get double points for every subsequent dragon you slay after the challenge is thrown (including the first one! ), and the challenger gets 0 points. This is pretty great, and is likely the outcome you want. Hooray! Honestly, just start with the red dragon. Sure, you might critically fail, but I find that it’s better to do that than risk losing dice to blue and green, only to get challenged and forced to face the red dragon later, when you’re weak. Fortune favors the bold, probably. Don’t underestimate the blue dragon. 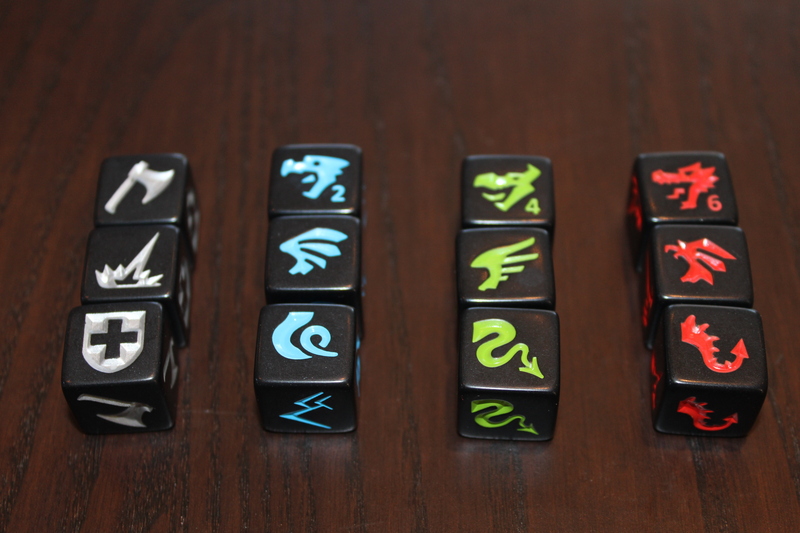 The blue dragon dice have only dragon pieces and Mountains, but the Warrior Dice have one Fire Breath each. This means you CAN STILL LOSE TO THE BLUE DRAGON. And that’s just embarrassing. If it’s your last turn, play until you’re toasted. You either go home a champion or in a box. If someone has already scored 40 points, you cannot stop until you’ve either beaten them or you’ve gotten toasted. Some people forget this. Don’t be afraid to throw down a Challenge. You can seriously hurt a solid run if they fail your Challenge, and you get 5 points. These are both great things for you, even if you only get one Challenge Token per game. It’s not a bad idea to throw it down if someone’s scoring more than 20 points on their turn, especially if they still have to fight the Green or Red dragons and they’ve lost Warrior Dice. I said fortune favors the bold, not the stupid. Only one Warrior Die left and you could fight another dragon? Don’t fight the red one. Go home. Remember that you can’t quit fighting a dragon until it’s dead or you’re toasted. I’ve also added a list of mehs, which are things that I would normally complain about but don’t matter as much given this game. This game is very light. This is not a thinker’s game, nor a cunning strategist’s. You roll dice, and duel monsters. Well, dragons, really. You’re not gonna see a lot of hurt feelings when this game is over. Kid-friendly. You can teach a young kid to play this game and they’ll probably enjoy it. There’s not much reading or high-level strategy, there’s just dragons and an axe. Short. Mercifully short. As has probably been made clear, I tend to prefer shorter games as you can get in a lot more variety in one evening. This game clocks in at slightly longer than the Lost Legacies, but not as long as, say, Tsuro. Rolling a bunch of dice is fun. There’s just something satisfying to it that I can’t really explain. I think that might have been the appeal of Yahtzee before everyone collectively woke up one day and realized Yahtzee isn’t … fun. Sorry, Yahtzee fans. The Challenge Tokens add just enough strategy / player interaction. I probably wouldn’t like the game quite as much without the Challenge Tokens, since otherwise you’re just sort of playing against yourself. 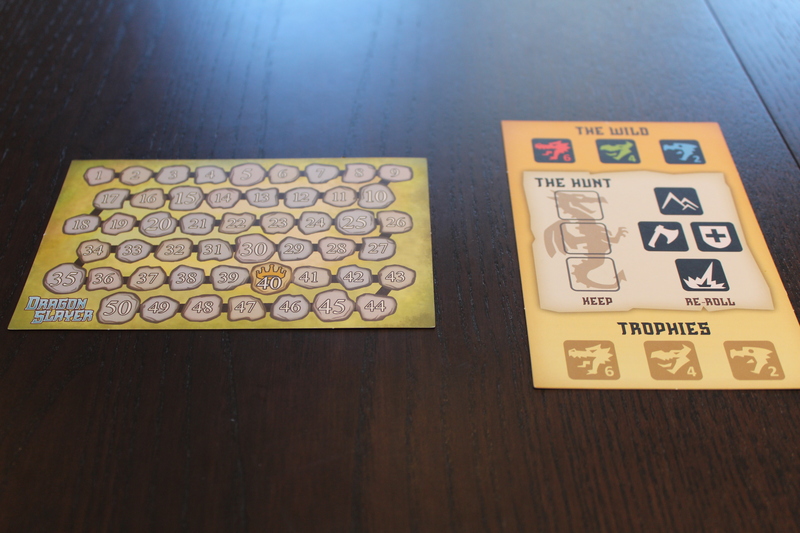 With the Tokens, however, other players have a chance to knock you off your streak. I’d kind of like to see other ways that players can affect other players, maybe by forcing them to only fight red dragons on their turn or turning Mountains into Fire Breaths or something. Very much a filler game. 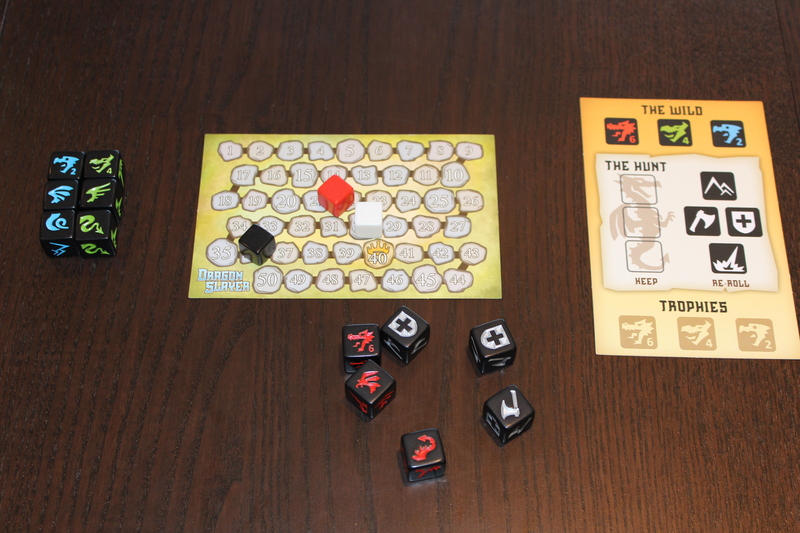 If you didn’t buy the Kickstarter edition, this game has 12 dice and 5 tokens. That’s it. There’s not a whole lot of heft to this game, and it shows. That being said, that’s mostly okay. Not every game needs to be Twilight Imperium. Heavy focus on luck. As you might expect from a dice game, sometimes you finish the game with 50 points, sometimes you finish with 0. This usually isn’t related to your strategy (unless you do something dumb) but is more just the way the dice fell for you. Personally, while I see this as a con in most games, for a filler game it doesn’t matter too much to me. Almost no player interaction. You could very easily just play this game solo and just see how high of a score you can get, which is then very much like playing Yahtzee by yourself and that’s sad. I think this could have been a lot more interactive, and I’m a bit bummed that it’s not. It’d be interesting if other players could help you for part of your score, as well. Challenges are pretty easy to game. Usually I’ll see people fight Red->Green->Blue->Red->Green etc, stopping somewhere in that cycle in case they get challenged. It’s better to be conservative if the player can challenge you, especially because the challenge is consistent and predictable. Dragon Slayer is pretty fun. That’s about the long and short of it. It’s not trying to be your favorite game in your library, and I think that’s okay. I think it tries to do something new with the whole “roll some dice” game style, and it does it mostly well at the cost of meaningful player interaction. 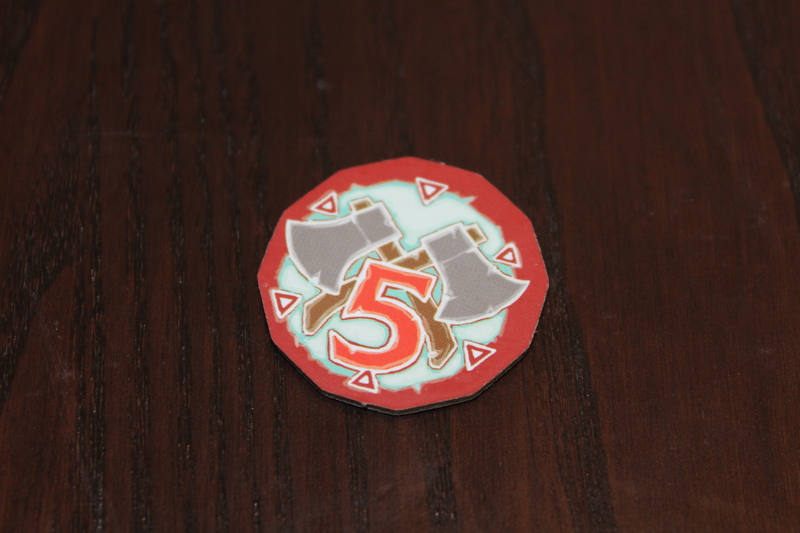 Sure, slapping down a Challenge Token is pretty fun, but it doesn’t … mean a whole lot. Which is also fine. It’s a short game that you play when you need a break. That being said, I think there’s something here that could be explored in a Dragon Slayer 2. What if there were more dragons, but they were randomly assigned before each round? What if you could team up with other players and split some points? What if you had different abilities and advantages / disadvantages against different dragons? Let’s add some needless complexity. Posted in reviewTagged board game, board games, competitive, competitive game, dice game, dice games, indie boards and cards, kickstarter games, tabletopBookmark the permalink.